This entry was posted in Capitalism, Contemporary Culture and tagged Labor on April 20, 2017 by apciv. 300,000 agricultural workers migrated to California during the Great Depression. By 1934 there were 142 agricultural workers for every 100 jobs. In 1928 Mexican-American workers earned 75 cents an hour for picking cantaloupes. By 1933 wages had dropped to 15 cents an hour. 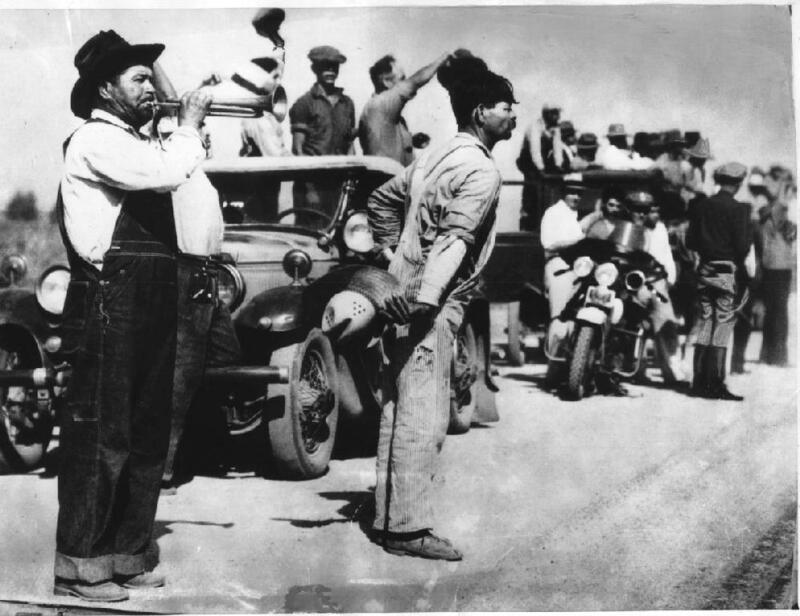 Cannery and Agricultural Workers Industrial Union (CAWIU) led many strikes in the Imperial Valley and elsewhere. Membership included Mexican, Filipino, Japanese, Chinese, Slav and Sikh workers. The Cotton Strike of 1933 brought out 10,000 strikers across 500 miles of farmland. Over the course of the decade the paranoid style of American politics asserted itself, leading to the use of Red Scare tactics by local authorities, the prosecution of activists under the Criminal Syndicalism Act of California, the deputization of landowners (a clear conflict of interest) and the rise of violent vigilanteism on the part of groups such as the American Legion. An act defining criminal syndicalism and sabotage, proscribing certain acts and methods in connection therewith and in pursuance thereof and providing penalties and punishments therefor. SECTION 1. The term “criminal syndicalism” as used in this act is hereby defined as any doctrine or precept advocating, teaching or aiding and abetting the commission of crime, sabotage (which word is hereby defined as meaning willful and malicious physical damage or injury to physical property), or unlawful acts of force and violence or unlawful methods of terrorism as a means of accomplishing a change in industrial ownership or control, or effecting any political change. This entry was posted in California Culture and tagged American Politics, Great Depression, Labor, Radicalism on April 6, 2008 by apciv.